Last week I posted a geology puzzle that I thought would be fun and somewhat challenging for anyone who care to try and come up with a solution. The puzzle consisted of several photos (only one of which is pictured here) showing the rock in the area with several different bedding orientations. Your job was to try and figure out what processes had occurred in this region which could possibly result in the current state. In this post, I’ll be revealing the answer! So, if you haven’t checked out last week’s post, What’s Going On?, make sure you take a look and try your hand at solving the puzzle before reading on! If you’re still reading, hopefully you’ve seen all the pictures and descriptions from the actual puzzle. If you haven’t – or if you don’t quite remember – here’s a quick recap (although I recommend glancing over the puzzle). You were presented with four pictures. The first three were all pictures of rocks with obvious bedding planes with a lake in the back/right of the picture. The bedding planes are near horizontal in the first image, at an approximate 45° angle in the second image, and near vertical in the third. All three pictures were taken facing the same direction and within 100 yards of one another as I walked along a near linear path. Naturally, if nothing significant had occurred here, the bedding planes would remain horizontal across the board. Therefore, these three images would seem to imply structural deformations (folding, faulting, or something of the sort). The fourth image was a close-up of fossils found in the region. Not being a fossil expert, I am not sure exactly what the animal is, but can tell you that it is a marine invertebrate fossil (in the phylum cnidaria anyone??). These and many other marine invertebrate fossils can be found throughout the area. The purpose of showing you this image was to help with the identification of rock type, which would give some additional clues. If you’re a fossil expert, you may have been able to narrow down the location based on spatial distribution of the fossil species shown…but as far as I know, nobody did. The strange structure, what you should have envisioned as a sort of twisting of the rock, would be difficult to achieve through large-scale tectonic deformations. If this were the case, applied forces would affect the entire region similarly, not uplift and overturn some portions, but leave others alone which existing only yards away. Faulting is a better explanation. Especially when you consider that rotation could have occurred between the two affected blocks. For example, a vertical fault occurs between blocks three (image three) and two (image two). Block three is rotated about 45° counter-clockwise relative to block two. Then, a second fault ruptures between blocks two and one, causing blocks two and three to rotate 45º relative to block one in the same direction. If you’re following this, you’d get the setup we have in the images: block one remains horizontal, block two is at an angle, and block three is now vertical! However, this isn’t right, either. Indeed, there are some rather twisted landscapes out there, but you must also consider the other hints provided. I won’t list them all our here (there’s almost 20 of them), but some important ones in debunking the large-scale faulting and/or folding hypotheses have to do with the location where I took these pictures, the short time period in which these processes took place, and what the presence of the lake has to do with the rock in this place. Quickly now, the location was more or less given after a few days when I explained that I was not far from home. If you were to visit the About section, or better yet click on the author profile, you should be able to figure out that I’m located in northern Ohio where there is very little going on (tectonically speaking, of course). The bedrock in northern Ohio is virtually flat, which tends to disprove folding. Faulting does occur here, but not too much and definitely not enough to turn bedding planes vertical. The short period of time is key here, too. Folding occurs over hundreds of thousands, if not millions of years. Without giving too much away, I tried to imply that this occurred not only recently and quickly, but that it occurred very recently and much too quickly for the geologic time scale. Finally, the lake. Why is there a large pit with a lake in the middle of an otherwise flat landscape? This does have a lot to do with how the “twisted” rocks appear…and now we’ll see why. By now, you’ve probably figured out that this was a trick question. Don’t hate me. This was not so much a trick, as a way to show how important it is to understand your surroundings when making geologic interpretations. The images and even the hints were purposefully vague in order to get you to think about all possible explanations. These pictures were taken on Kelleys Island in Lake Erie, along a hiking trail which (nearly) circumnavigates Horseshoe Lake. While many of the folks who left comments were seeing signs that they were not looking at folds or faults, but broken off pieces of rock, one person was able to determine that what we’re looking at is the edge of a quarry (good job!). Now, I know some of you might find this answer to be a little discouraging. After all, this was supposed to be a geology quiz…how come the answer had nothing to do with geologic processes??? Well, in many ways, it did! Kelleys Island started out around 400 million years ago when it lay at the bottom of a shallow sea (Late Silurian to Devonian). Here, the marine environment led to the deposition of limy sediments which eventually lithified and became the limestone (and dolostone) rock making up the present-day island. Over time, as we can see now, the seas receded and the region was uplifted. Erosion and non-deposition prevailed over the last 200 some million years of Ohio’s history, with glaciers up to a mile thick scraping over the northern two-thirds of the state in the last two million years. At Kelleys Island, you can still see the scars of the most recent glacial advance, about 14,000 years ago. 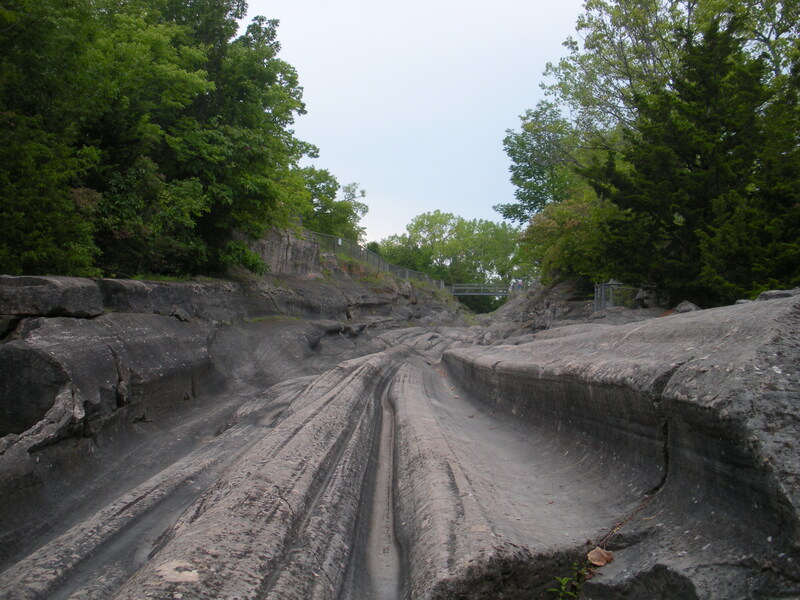 The combination of this uplift and erosion allowed the limestone rocks on Kelleys Island to become exposed at the surface. Here’s where we benefit. 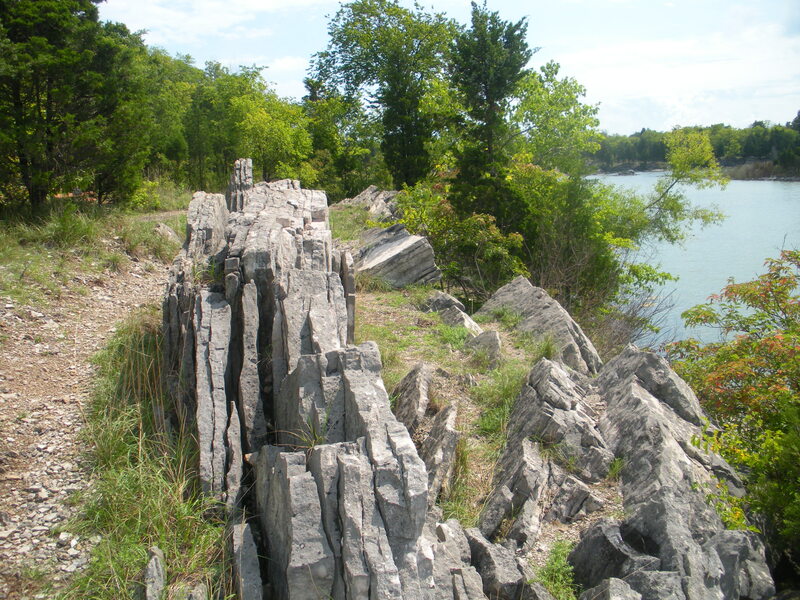 Quarrying of the limestone at Kelleys Island began in the 1800’s. The limestone here served as dimension stone (used for building) and lime (used in building and engineering materials, as well as for agricultural and many other purposes). Additional uses of the quarried stone included aggregate (for concrete), road ballast, and flux (for use in iron and copper smelting as well as glass manufacturing). At one time, Kelleys Island was home to the world’s largest producer of limestone and lime (the Kelleys Island Lime & Transport Company). There is a very good probability that you are a direct benefactor of Kelleys Island limestone! Clearly, there are many uses for quarried limestone, which is why quarries have operated on Kelleys Island almost continuously since they started…until two years ago. At this time, the last active quarry on Kelleys Island was unexpectedly shut down. The reason for this is something about the operations that seriously impacted the island’s residents. The limestone being quarried also served as the island’s aquifer. An aquifer, if you don’t already know, is a rock unit which holds lots of water within the pore spaces and fractures in the rock. The water can then be extracted for public or private uses, such as irrigation, industrial and household uses and drinking. All of these were being employed on the island at the same time as the quarry operations. In order to cut into and extract the rock without the pit filling with water, quarry operators must employ industrial pumps to “dewater” the aquifer in this area. In other words, they lower the water table to below the base of the quarry. The recently closed limestone quarry has since filled with water. What did this mean for Kelleys Island? Because the water table was lowered, many residents had to go without water because their private water wells went dry. There was also speculation that the water was contaminated by the lime dust created by the quarrying operations. However, this is not true since lime is actually created outside of the quarry (you have to “cook” the limestone at nearly 1,000 °C to create lime). Even without contamination, the lack of water to wash and drink obviously troubled the residents enough to file multiple complaints. Eventually these complaints got the better of the company and operations were shut down in 2009. Why did this happen and what could have been done to avoid it? Well, there’s lots of speculation and little known factual information. My personal opinion is that the company either did not follow their hydrogeologic surveys very carefully, or the surveys were not accurate. Obviously when dealing with quarries, this is a very important piece of information that can drastically affect operations! Had proper hydrogeologic interpretations been presented and strictly followed, the quarry would still be busily working away and the island residents would have never worried about having access to fresh potable water. Of course, maybe the quarry just got greedy and pumped out more water so they could dig deeper….all speculation. The East Quarry, where the puzzle pictures were taken, has been abandoned for a long time before this and is now called Horseshoe Lake, due to the shape of the pooled water inside. The “twisted” limestone rocks, as you now know, are a result of broken pieces along the edges of the quarry, and not due to any folding or faulting (sorry structure people!). I hope you found the puzzle challenging and have learned a little more about how geology affects you! If you enjoyed this article – or anything on this site – please continue to make use of those buttons down there (↓) and share with your friends! 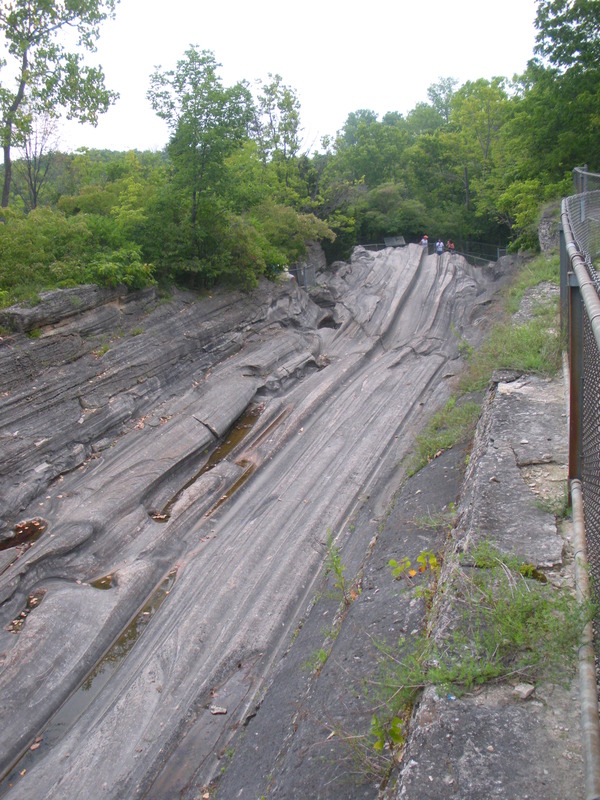 Those glacial grooves were really cool! Also, I wouldn’t credit myself too much. Last year I had Wells’ geomorph class that prepped me for this sort of thing. Well, my collapsed mine theory was not too far off.